Dr. Kaushal Pandey is one of the best Surgical Cardiologist in Mumbai with an experience of almost 3 decades in this field. Dr. Kaushal Pandey brings to Wockhardt Heart Hospital a vast experience of performing more than ten thousand Cardio-Thoracic & Vascular Surgeries in India. Wockhardt Hospitals, South Mumbai-A New Age Hospital. Dr. Kaushal Pandey's experience spans over 3 decades. This began with his five years stay in Australia where he was affiliated with the following hospitals: Epworth Hospital, Melbourne, Australia. (1986 to1988), The Royal Melbourne Hospital, Melbourne, Australia. (1988 to1989), The St. Vincent’s Hospital, Melbourne, Australia. (1989 to 1990) and The Prince Charles Hospital, Brisbane, Australia. (1990 to 1991). 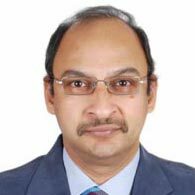 Dr. Kaushal Pandey returned to India and joined P D Hinduja hospital in March 1991 as a Consultant in Cardiovascular Surgery. He worked as a full time surgeon from March 1991 until September 2000. During this period of 9 ½ years, he performed over 6000 Open Heart Surgeries. Dr. Pandey left Hinduja Hospital in September 2000, but rejoined the institution 3 years later as a part-time surgeon. Dr. Kaushal Pandey has now completed a little over 13000 Open Heart Surgeries in the city of Mumbai. He is indeed a very prolific Surgeon and among the busiest surgeons in this part of India. 70% of his surgical work involves CABG and Redo CABG surgery. 25% of his work is Valve Replacement and Repair Surgery, whilst the remaining 5% is surgeries for Congenital Heart Defects and Vascular Surgery. Dr. Kaushal Pandey performs CABG using arterial grafts – both Internal Mammary Artery and Radial Artery grafts. He has been a pioneer in the resurgence of Tissue Heart Valve in India. Valve Surgery is his forte and he has delivered lectures and research projects in at-least 7 Asian countries outside India. He is also into Annuloplasty Ring Repair for Ischemic Mitral Regurgitation and Tricuspid Valve Repair. He is also a master of surgery for Infective Endocarditis. He is closely associated with Mulu Rafflesia Group, which encourages research and education in Valvular Heart Surgery in Asia. Dr. G. V. Karve for standing first in Surgery at M. B. B. S. examination. Vinayak Jagannath Shanker Sheth prize for Surgery. P. K. Sen Memorial Oration at Indian Association of Cardiothoracic Surgeons Conference, Bangalore, 2006.